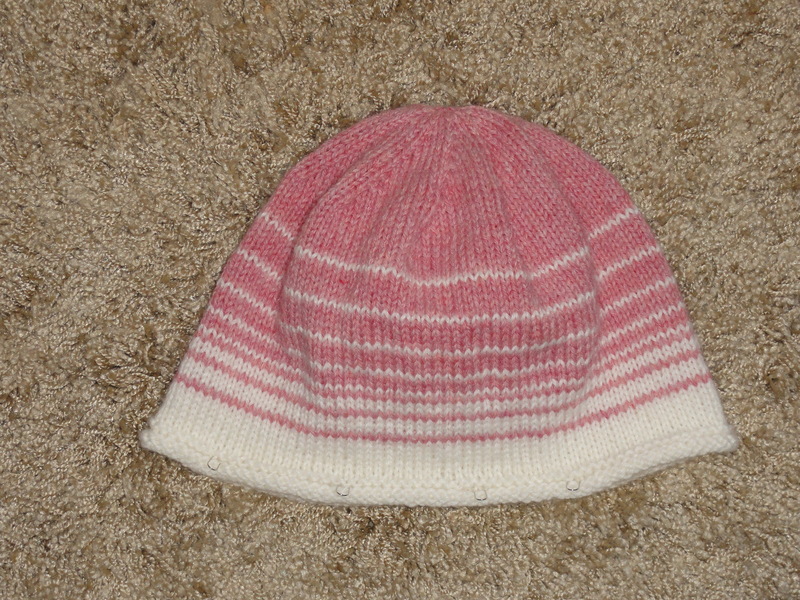 I had an urge to knit some girly-girl hats, and there’s nothing more girly-girl than pink. I had Knit Picks Wool of the Andes on hand in two shades of pink, Rouge and Blossom Heather, as well as some WotA in White, so I went to work. The Candy Stripes Rolled Brim Hat is my own design, which you can download by clicking here or clicking the Patterns link. It’s worked in Blossom Heather and White. Next came the Sixteen Hearts Hat. This hat was inspired by the Loving Hearts Hat , but I completely redesigned the hat, changing even the colorwork chart. 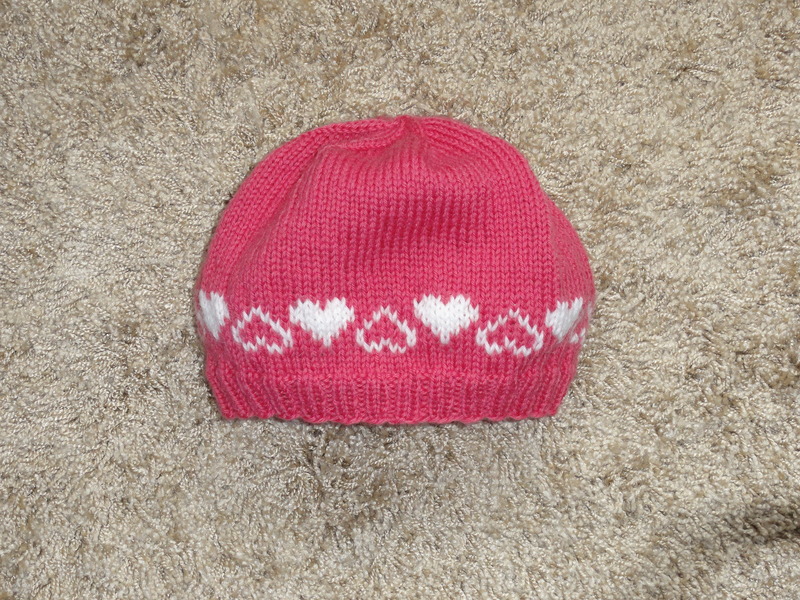 While the Loving Hearts Hat is knitted from the top down, I knitted my hat from the bottom up. I changed the heart pattern from a 12-stitch repeat to a 14-stitch repeat. This gave the hearts a little more space so they don’t look so jammed together. I used K-P WotA in Rouge and White, and to great effect, if I do say so myself. If you like this hat, the pattern can be found here, or click on the Patterns link. 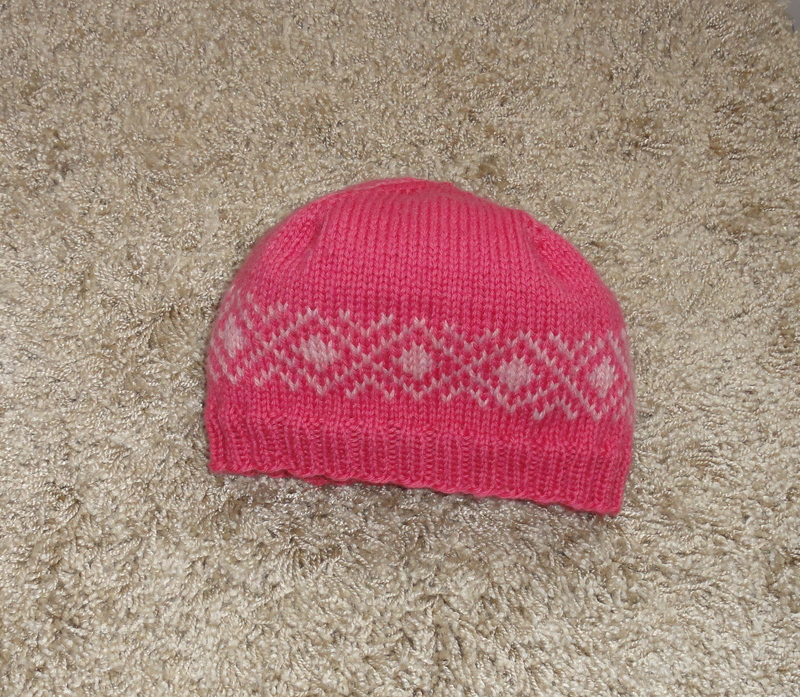 While I was working on these two hats, I couldn’t help but think about making a hat that used both shades of pink. The design that kept calling to me was Winter’s Coming (http://kalmanac.wordpress.com/2010/08/03/winters-coming/), which I had knitted in red and white a while back. I thought it would look lovely in Rouge with Blossom Heather as the contrasting color. I have named it Double Pink Diamonds Hat and here’s a picture of it for your viewing pleasure so that you, dear reader, can judge the result for yourself. This entry was posted in Hats, Knitting and tagged Knit Picks Wool of the Andes, knitted hat, knitted hat pattern, worsted weight wool. Bookmark the permalink. ← Which Came First, The Button Or The Hat? Cool, I finally found the like button! I love your hats. Even in our 105+ degree weather, your hats make me smile! And most winter themed patterns just make me crinch at this moment. Dark/hot pink and white is, and has been, one of my all time favorite combos. And I love that Winter’s coming chart. I have saved that pattern in my Rav library. Yeah, isn’t the Winter’s Coming chart really cool? I’m certain I’ll be using it again and again. Thanks for the kind words about my hats. I’m glad I can make you smile, especially considering how hot it is in Texas right now. I hope you get some rain and cooler weather soon. These hats are so beautiful! Thank you, Kathy. They were fun to knit.